In art history most flower compositions are not painted after an actual bouquet, simply for a simple reason that not all types of flowers bloom together. Artists were therefore forced to make sketches after the diverse flowers and to arrange them in a composition afterwards. However, most compositions that Sluijters made are painted after actual flower arrangements. 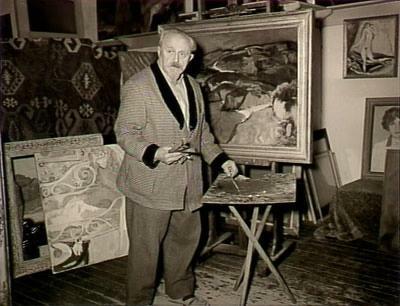 There is an anecdote that every bouquet that came in his house first was brought to his studio, so Sluijters could paint it. 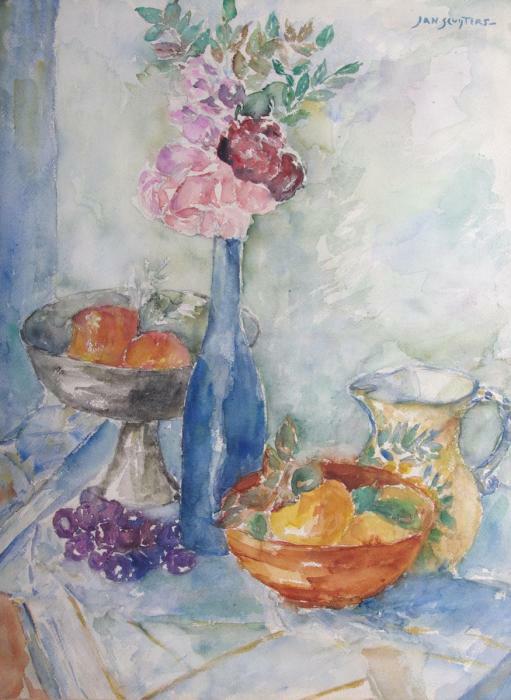 This watercolour shows a cheerful still life in a moderate expressionist style. Sluijters roughly set out the composition with pencil, later filling in the different colour fields. A white tablecloth covers a table; on the table several items are placed. An earthenware water can with a Dutch ‘Boerenbont’-like motive and a bowl with fruit on the right side, some purple prunes and a fruit bowl on a stand on the left. In the centre of the composition Sluijters placed a blue glass bottle, in which pink roses and peonies or rhododendrons are placed, alternated with green leaves. For a colourist like Sluijters, flowers were of course a perfect subject for his expressive style and use of vivid colour. Jan Sluijters, together with Dutch painters Leo Gestel and Piet Mondriaan, belongs to the first generation of ‘modern’ painters in the Netherlands. He received his artistic training at the Amsterdam Art Academy in 1901, and won the renowned Prix de Rome four years later, a prestigious award which supports young artists. Sluijters visited Paris (1904-1907), where he was introduced to the . . .